Been away for a while since my last post. Winter is ending but, we can still feel the nip in the air in the mornings. From savouring warm Gajar ka Halwa (Carrot halwa) to sipping a hot cup of tea with steaming Momos, Delhi is an absolute wonder in winters. The winter vegetables, a riot of colours in Delhi need no introduction. Its these veggies which inspired me to cook up a storm one evening and the outcome was excellent. Thought of sharing the recipe with you all. (I avoided batter frying as it kills the natural flavour of prawns). Blanch Broccoli and French beans in salt water for 2-3 mn(ensure that they are still crisp). Shallow fry mushrooms in 1tsp oil n salt and keep aside. In a wok add 2tsp Olive oil, garlic and saute the broccoli and beans for 2-3 min, then add mushroom and rosemary for garnish. 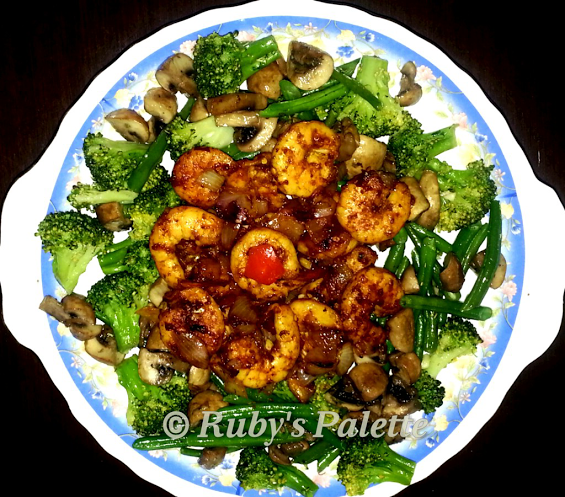 Arrange the Prawns on the bed of veggies and serve hot ! Do leave me a comment after trying this.